On last week's episode of Clone Wars, it looked like Hondo, the pirate who just won't go away, was pretty thoroughly boned. He had just attempted to hijack a ship full of Jedi younglings, then kidnapped and promptly lost Ahsoka. And, after that incident in which he kidnapped Count Dooku, he can't exactly turn to the Separatists for support. But when General Grievous attacks the pirate base and captures Hondo, he's forced to make an unlikely alliance, one that suggests that the old salt has a soft heart after all. Plus, we get to see Ahsoka battle Grievous and Katooni finally earns her Jedi wings. Spoilers ahead. This episode picks up where last week's left off, with most of the younglings, having just rescued Ahsoka from Hondo, speeding toward their ship so they can get off Florrum and get home. They meet Ganodi and Huyang (David Tennant once again underused and sounding nothing like David Tennant), but their escape from the planet is hindered by a crew of Hondo's pirates. But as the pirates attempt to return to the base, they find that the area has been overrun by droids. General Grievous storms into the base, interrupting Hondo's cocktail hour (although the way things have been going, it might be a cocktail week), and announcing that Florrum is now under Separatist rule. 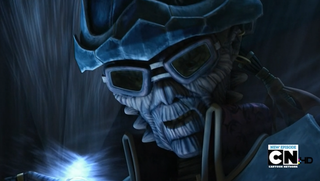 He also delivers a cold message from Count Dooku (during which Hondo gives and wonderful, put upon grunt; as sick as I get of Hondo, I do enjoy Jim Cummings' voice acting) telling Hondo that the pirate is now his prisoner. Meanwhile, outside the base, Ahsoka realizes that Obi-Wan must have been beaten back, meaning the entire system is likely under Separatist rule. Her pirate captor muses that he could trade the Jedi for his freedom, but she notes that if Grievous controls the system, he's unlikely to barter with a lowly pirate. The pirate reveals that Hondo does have a backup plan: a personal fleet that no one but Hondo knows the location of. Ahsoka doesn't even bat an eye before deciding that they'll all go rescue Hondo, find the fleet, and get off the planet. Ahsoka may have a lot of Anakin's rashness, but here she certainly knows how to control her feelings. She's not going to hold a grudge when Hondo might be their only chance of rescue. And she's earned enough credit with the pirates that they admit they could use her help. With the help of R2-D2 and the reliable stupidity of droid foot soldiers, the pirate-Jedi team manages to sneak into the pirate base, where they find Hondo energy chained to a wall. Hondo quickly realizes that they haven't come simply to rescue him, and he has doubts about their ability to get past Grievous' army. But Huyang assures him the younglings are up to the task. Excited, Hondo demands to see their lightsabers. They happily comply, but Katooni's still isn't finished. Huyang tells her that she must believe that all the pieces fit together and Hondo is practically bobbing up and down at the prospect of watching a live lightsaber construction, saying that it's worth all of the riches he lost out on. We're never sure which Hondo we're going to get from week to week (maybe it's all the booze? ), but this week we get the lovable rogue, the connoisseur. I can almost believe that he hijacked the youngling's ship because he felt such an intense appreciation for Jedi artifacts. Katooni finally completes her lightsaber, and a small bond forms between youngling and pirate. When Ahsoka questions Hondo on his reluctance to team up, he tells her, "I may be a pirate, but I don't like taking children into battle." Ahsoka calls him out on the fact that this all started because he attacked her ship. He laughs, "Well, today is a new day, and lucky for you, today I like children." I'm telling you, Ahsoka, it's the booze. They free the rest of the captive pirates. One of the droids contacts Grievous to tell him that they're under attack by "miniature Jedi," and Grievous launches an all-out assault on the base. The pirates and Jedi fight their way out to their vehicles. Katooni hops aboard a speeder with Hondo. "I've got your back," she tells him. "Greaaaaat," he replies dryly. "I feel so safe." The pirates drive into the hidden cavern where Hondo keeps his spare ships, leaving the Jedi behind. When Katooni protests, he tells her that she can come with them and become if she'd like. "Ahsoka trusted you," she says. "We all trusted you." That's the problem with making Jedi allies: the guilt. This was the character development from Katooni I was hoping for. She feels a small connection with Hondo and is no longer afraid of him, giving her the power to assert herself. I can only assume that this will carry over into her future adventures. Just as Ahsoka and the younglings are confronted by Grievous, the pirates swoop in, giving the younglings an exit. Ahsoka and Grievous duel for a bit (always fun to watch Grievous wield his many lightsabers), and she beats him back long enough to escape. Hondo takes a few satisfying shots and Grievous from his ship, but Grievous is upright and cackling afterward. Hondo returns the younglings to Obi-Wan, putting on a big hammy show about how he should be compensated by his troubles, but he's clearly play-acting here. His tenuous alliance with the Jedi has been restored, despite his bad behavior, and when Obi-Wan doubts that Hondo meant to stage a rescue mission, Hondo waves his hand and tells Kenobi he'll send him a bill. But before he boards the ship, he and Katooni exchange a small, warm glance. Hey, if Katooni washes out of Jedi training, she could always become a pirate. Thus concludes the young Jedi arc. It's been nice to see so many episodes with badass Ahsoka, but it's definitely time to move on. Next time: R2-D2 heads out on a mission of his own. Hopefully, Hondo will keep his spiky face out of this one.